Synthony is done and dusted for another year after two massive sold out shows last weekend. The lineup featured P Digsss (Shapeshifter), Ria Hall, Helen Corry, Omega Levine, sax legend Lewis McCallum, backing singers Cherie Mathieson and Iri Aumatangi, the 90-piece Auckland Symphony Orchestra conducted by Peter Thomas and all hosted on the night by General Lee. For those who are late to this party, Synthony is one big music, dance, lighting and visual extravaganza in the Auckland Town Hall. Basically, 20 of the biggest dance hits orchestrated and produced on a massive scale. The two shows sold out in a matter of hours. I’m hugely proud to be a part of the creative team, working closely with Erika Amoore (one of the event creators) to produce the orchestral realisations of these tracks. As an arranger it really is such a treat to be able to work on an entire show of such forces. The scale is huge. Here are some stats on what we produced: 236 pages of conductor’s score, 720 individual orchestra parts, all adding up to 2531 pages of printed music being played on the night. This year every department upped their game and knocked last year’s triumphs out of the park. Musically, the arrangements are bigger and better, the orchestra itself is bigger too… and we unleashed the Town Hall organ! There were 15 brand new tracks, and the 5 repeat tracks from last year were all refreshed. There were moments where the steaming crowd just stood in awe. Intense harmonies revolved around the track’s crazy catchy melody – violins jived into where the synth cuts-off, the cellos emulated a bass pad, trumpets and organ climbed into the drop - a compositional feat of orchestration work. Immense thanks to Peter Thomas and the Auckland Symphony Orchestra who did an amazing job bringing this music together… with click track pumping in one ear… deafening audience in the other… with lights in all directions… while beads of sweat gather on the forehead… and yet they still smile and deliver yet another top level musical event for Auckland. Finally, huge kudos to Erika Amoore and David Elmsly for their incredible vision and direction of this event. It really is quite something, and I’m already looking forward to the next one! 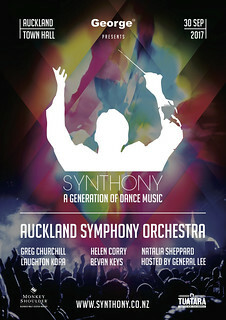 Saturday night is going to be a totally epic night as Synthony kicks off in Auckland. DJ + vocalists + choir + symphony orchestra + an incredible visual feast which I'm not sure the Town Hall has ever seen before. "Leave your Nan at home, THIS IS NOT AN ORCHESTRA AS YOU KNOW IT or a sit down affair... this an event you will lose your sh*t at." And yes, the rumours are true, I'll be up the back thrashing the tambourine and caressing the thunder sheet as part of our impressive percussion section. But, it's been quite a journey leading up to this, and I haven't actually posted much about it, so here's a run down. July 2016, the journey begins. Peter Thomas calls me and says he’s got a great gig on the horizon. He always does, but this time I knew it was special. He explains the concept and sends me off to watch the Ibiza Proms at the Royal Albert Hall. Online, not in person! I watch it. I’m sold. I’m in. My first real taste of the project was in March when the first two arrangements were done and recorded for the promotional video. Wow, got the feels. Two arrangements down. Eighteen to go. For a few years, Peter Thomas and I have pondered doing a project where we could get young secondary school arrangers involved. There is always opportunities for composers, but there are some hugely talented young arrangers looking for experience. We knew this project was perfect, and so we recruited: Tom Lawton, Ki Hoon Sung, Matthew Beardsworth, Sarah Rathbun, Vivien Whyte, Lauren Tantrum, Angeline Xiao and Weihong Yi. Legends. I briefed them and mentored them along the way, sending countless emails of feedback and reassurance. The tracks mentioned in the interview were Robert Miles by Children, Right Here, Right Now by Fatboy Slim and Silence by Delerium. Want to know what the other tracks are? No, not likely, come to the show. So early September arrives and I'm done. The 20 orchestra scores and 580 instrumental parts (who's counting?) are proofread and it's all off to the printer. Massive shout out to Erika, David and Peter who dreamt up this event, brought me onboard and have all been absolutely wonderful to work with. Special thanks to the Auckland Symphony Orchestra for doing an almighty job playing all the notes. Three rehearsals down, two to go. If you've got a ticket, you're in for a treat. Bring your best dance shoes. Carb load. You know the deal.